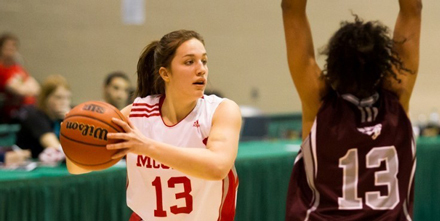 Gabriela Hébert, a sophomore from Chicoutimi, Que., came off the bench to score a career-high 19 points as the sixth-seeded McGill University women's basketball team waltzed to a convincing 71-50 victory over Ottawa in the consolation round final at the CIS Final Eight championship to finish fifth overall. Gabriela Hébert, a sophomore from Chicoutimi, Que., came off the bench to score a career-high 19 points as the sixth-seeded McGill University women’s basketball team waltzed to a convincing 71-50 victory over Ottawa in the consolation round final at the CIS Final Eight championship to finish fifth overall. Not a bad result for the Quebec conference champions, who did not crack the CIS weekly Top 10 national poll once throughout the season. Windsor (3-0), under the guidance of former McGill assistant coach Chantal Vallee, won the CIS banner for the third straight season with a 66-57 win over Regina (2-1) in the gold medal game. Saint Mary’s (2-1) claimed bronze with an 83-73 decision over Calgary (1-2). Hébert played a large role in McGill’s victory, shooting a perfect 7-for-7 from the floor, including a 3-for-3 effort from three-point range. The 5-foot-8 forward also made two of her four free-throws to go along with a pair of steals, one rebound and an assist. The Martlets jumped into an early 13-2 lead, then stretched the spread to 14 points before Ottawa’s Jenna Gilbert settled the losing side down somewhat with a three-pointer to finish the quarter at 21-10. The second quarter was no different as McGill opened up a 39-21 advantage before taking a 40-24 lead into halftime. The Gee-Gees then outscored McGill 16-12 in the third stanza, narrowing the gap to 52-40 but McGill pushed the pedal to the metal and won the final quarter by a 19-10 margin. Mariam Sylla, a 6-foot-1 post who was named earlier in the week as the CIS rookie of the year, was the only other member of the Martlets to reach double figures in scoring. She had 14 points to go along with a game-high eight rebounds. Sylla ended up as the team’s second-leading scorer over the weekend with 34 points and a team-high 28 rebounds. Anneth Him-Lazarenko, a fifth-year education senior who is the only player expected to graduate, finished with eight points and seven rebounds. The 5-foot-10 power forward completed her brilliant career with 1,545 points and 858 rebounds in 118 games overall, ranking eighth and fourth, respectively, among McGill’s all-time leaders. Other leading scorers for McGill included team captain Francoise Charest (8 pts.) and Helene Bibeau (7). Kim Cupid, who was named as Ottawa’s player of the game, paced the Gee-Gees with 10 points and pulled down five rebounds. McGill, which had a huge 29-17 advantage in turnovers, shot a sparkling 46.3 per cent from the field (25/54), 22.2 from the arc (4/18) and 63.0 from the line (17/27), compared to Ottawa, which shot 29.8 (14/47), made 4 of 13 treys and went 18-for-23 from the charity stripe. The Martlets finished their campaign at 21-12 overall, including a 21-10 mark against CIS opponents and a 13-3 first-place finish in the RSEQ conference. The team is scheduled to land at Trudeau airport on Monday at 8 p.m. Next on their agenda is the annual Friends of McGill basketball awards banquet on April 13 at the Holiday Inn Midtown on Sherbrooke Street.